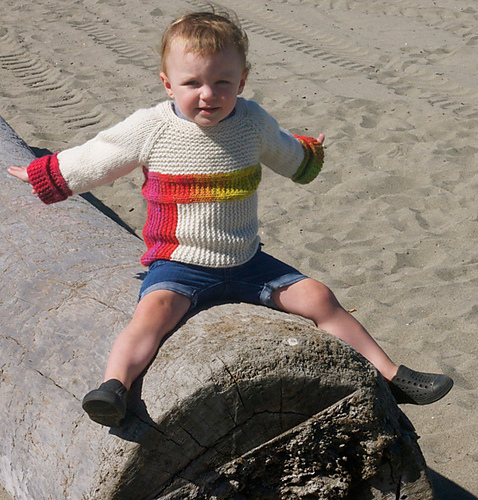 This summer/fall when my dear Emily came to town she had a mission: get a cute pic of Hunter in her latest design. We headed down to the beach with brand spanking new Jones and a relatively happy 1.5 year old Hunter. It was a glorious day and Hunter didn’t even mind that we made her put on a chunky weight sweater in the hot sun. That girl has grown accustomed to putting on knitwear in all kinds of inappropriate weather! 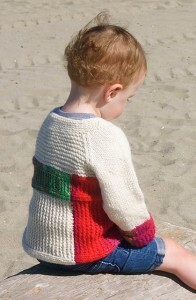 A lovely new pattern from Ms. Emily Wessel, Chunky Rainbows combines 2 of her loves: Cascade Eco Wool and Noro. You may remember her blanket sensation POP, it takes the same yarn. The Chunky Rainbows pattern is available for free from Petite Purls here, you just need a skein of Cascade equal and a couple of coordinated skeins of Noro Kureyon. I might add that it’s perfect for a baby shower, the wee size would knit up in no time! This entry was posted on Saturday, January 19th, 2013 at 2:33 pm	and is filed under Uncategorized. You can follow any responses to this entry through the RSS 2.0 feed. Both comments and pings are currently closed.